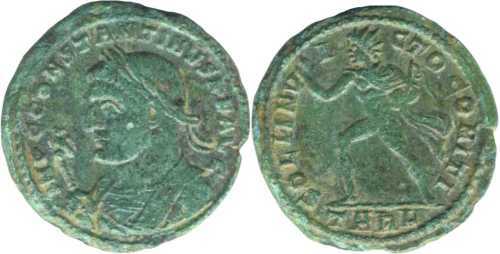 RIC VII, ARLES [after 19], CONSTANTINE I, REVERSE VARIETY, BUST TYPE K3 l.
IMPCCONSTANTINVSPFAVG [IMP C CONSTANTINVS P F AVG]; bust l., laur., wearing trabea, eagle-tipped sceptre in r. hand. SOLIINV-I-CTOCOMITI [SOLI INVICTO COMITI]; Sol advancing l., chlamys flying under l. arm, raising r. hand, in l. hand globe close to body and whip. TARL in exergue. REVERSE VARIETY. Rev. similar to rev. of ARLES 19 (Sol advancing l., chlamys flying under l. arm, holding globe close to body) except for Sol holding globe and whip instead of globe only. Not listed in Ferrando. Coin should be listed after ARLES 19. ARLES [after 19], CONSTANTINE I, REVERSE VARIETY, BUST TYPE G5 l.
Coin sold on eBay in May 2015 for EUR 267.88 [Thanks to the collaboration of Tomasz Speier].